Heat the oil in a pan over medium heat. Cook the sausage until it turns slightly brown. Add the onion and peppers and sauté until soft, scraping all the brown bits as it cooks. Don't rush it! Let the onion and peppers caramelize slowly, bringing out all the flavors. 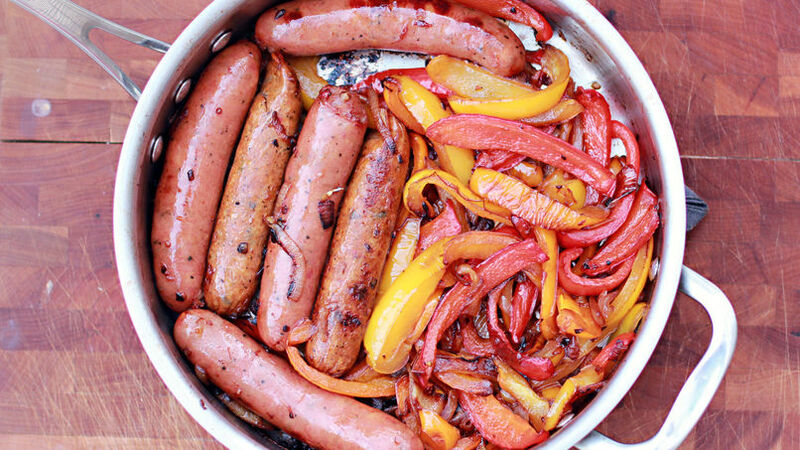 When it comes to quick and hearty meals, sausage recipes should be at the top of the list. You can find great-quality sausage these days, with a vast variety of herbs and spices. My particular favorite is a natural chicken sausage with a blend of herbs and apples. Simple sausage recipes take just a few ingredients and are served up quickly, making this chicken sausage and peppers recipe a favorite at my house.